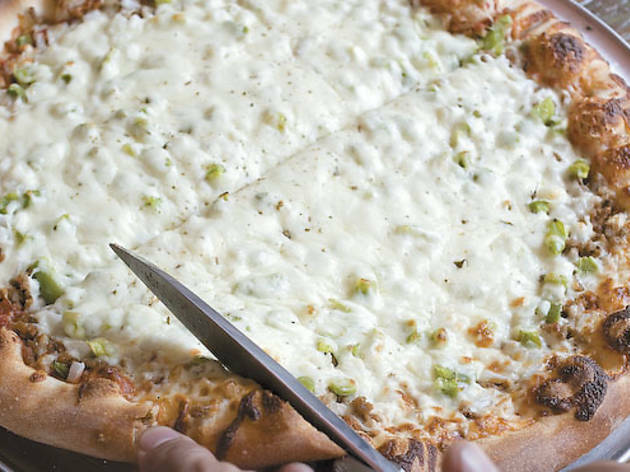 Roots, a new pizza joint in Chicago, is slinging Quad Cities–style pizza. Which raises the question: What the hell is Quad Cities–style pizza? 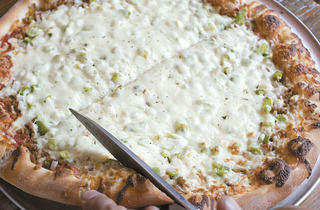 Photograph: Martha Williams Quad Cities-style pizza at Roots Homemade Pizza in Chicago. First, a quick primer: The Quad Cities refers to a grouping of five small urban areas on the Illinois-Iowa border: Rock Island, Moline, East Moline, Davenport and Bettendorf. Yes, that’s five cities falling under a moniker reserved for four, but consider this par for the course, as strange turns to weird from here. Take, for instance, the pizza this quintet of towns calls its own: A malt-heavy dough is formed into a thin round, entirely covered with a thin layer of finely ground sausage and a mozzarella blend, baked in a rotating deck oven and then cut not into slices but into strips…with scissors. And the most popular variety apart from the sausage? Taco. “Yeah, it’s exactly what it sounds like…gringo Mexican on a pizza, complete with tortilla chips and Heinz taco sauce,” says Greg Mohr, a Rock Island native and part of the team behind Roots Handmade Pizza(1924 W Chicago Ave, 773-645-4949), which opens this week. Mohr went straight to the source to deliver Chicagoans a taste of the real deal, tapping the Quad Cities’ famed Wise family as consultants for Roots and procuring a Roto-Flex oven (the go-to cooking vessel for Quad Cities pizza; it puts out two-dozen large pizzas in about 12 minutes). The result? An odd pizza. But one Mohr hopes Chicago will adopt (making us city No. 6, by our count). The dough It must contain a “spice mix” that is heavy on malt, which lends a toasted, nutty flavor, and it must be hand-thrown to be stretched into an even quarter-inch thin crust with a slight lip ringing the edge. The sauce Thanks to both red chile flakes and ground cayenne, the smooth, thin tomato spread is more spicy than sweet. The sausage Moderation is a term never used with Quad Cities pizza, as evidenced by a thick blanket of lean, fennel-flecked Italian sausage that’s ground twice and spread from edge to edge—if you can see more than a glimpse of tomato sauce beneath it, somebody’s asleep at the wheel. The cheese The Wises, and Roots, source their mozz blend from Battaglia distributors. They look for enough moisture for an even melt, but not so much that an oil slick forms.